Hello again Holga here from Chapter Crafts to show you how to do this card. 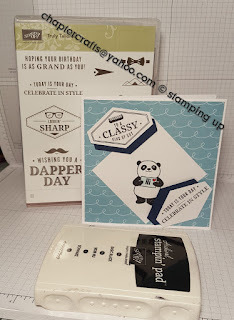 I love the panda sale.a.bration stamp set I can't seem to leave it alone. Thought this might be an ideal card for the male in your life. Here's how I've made it. Whisper White card 4 15\16" x 9 7\8"
Sweet soiree designer series paper 4 3\4" x 4 3\4"
Using the punch that comes in the bundle punch out 1 in sweet soiree dsp and stamp your sentiment on Whisper White card and punch out.